The members of the Haddonfield Police Department want the community to know they appreciate its support. 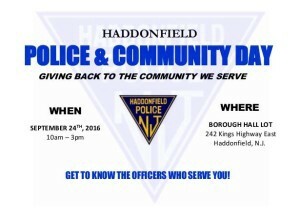 To say thanks, the second annual Haddonfield Police and Community Day will be held Saturday, Sept. 24 beginning at 10 a.m. and ending at 3 p.m. at Borough Hall. Last year’s inaugural event was held to give back to the community and create an opportunity for residents to meet members of the police department. This year’s event will follow suit, but with more events and activities. “I like to think that we as Haddonfield Police, generally speaking, have a great relationship with the public. The hope is that this event fosters that and encourages it as well,” Det. Cpl. Danielle Mueller said. Last year was extremely difficult for police as a whole, Mueller believes. She said the job has become increasingly dangerous and more difficult. After officers were shot in Texas in July, as a gesture of kindness, random Haddonfield citizens brought things to the police department to show their appreciation of the police. “It was really awesome. We received homemade cards from kids thanking us for our service, food for officers and even families visiting us at the department to say ‘thank you.’ We all appreciated every gesture and thought. We have been lucky that as a whole, negative news media about police has affected us (Haddonfield) more minimally than other towns,” Mueller said. Haddonfield Police and Community Day is a chance to continue to build the department and community’s positive relationship. “This is our second year of doing this event; we hosted the original event with the intention of it becoming an annual thing. We had great success and such positive feedback from the first event that hosting it again was a no brainer,” Mueller said. This year, like last year, there will be bounce houses, food, music, a K-9 demonstration, a karate demonstration, a basket auction, bicycle registration and police, fire and EMS vehicle tours and photo opportunities. However, there is much more that is new this year. There is a bicycle rodeo, child ID fingerprinting, superhero and princess appearances and photo opportunities, ice cream from Mister Softee, and a few surprises planned. There will also be a Can Jam Challenge and the announcement of a fourth-grade drawing contest. The Can Jam Challenge will feature a Haddonfield police team against a Haddonfield Memorial High School seniors team. For the drawing contest, each Haddonfield school was invited to participate and the winner will get their picture framed and hung in the Haddonfield Police Department, as well as a pizza party for his or her class, provided by the police department. All of this is available to the public for free, as baskets and money were donated by local businesses and organizations for the event. Mueller hopes people who come enjoy themselves and come to an understanding of whom the police really are and what they do.